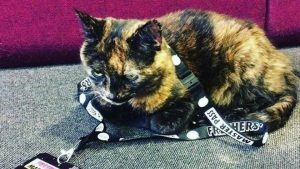 After hearing yesterday’s terribly sad news about our favourite real cat Susu’s passing, paying our respects was an absolute must. We are very proud of being a cat-loving publication (Susu was visited by us on a daily basis, really), so naturally some of our biggest cat lovers gathered to share their love for the best cats in the entertainment world. Described by Sirius Black as “The most intelligent of his kind I’ve ever met,” Crookshanks was the pet cat of Hermione Granger from Harry Potter and the Prisoner of Azkaban onwards. He bears very close resemblance to a Persian Cat, and Rowling said he was half-Kneazle, a cat-like animal who is incredibly sensitive to dishonesty. He has a strong dislike of untrustworthy individuals (which is why he was so anti-Scabbers), and his appearance resembles a lion – he’s ginger in colour and has a squashed head, described by Harry Potter as looking like he had “run headlong into a brick wall”. 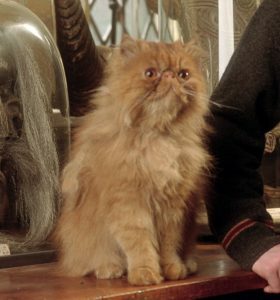 Crookshanks had yellow eyes, a giant fluffy tail and bandy legs, and was incredibly playful, enjoying chasing gnomes, attacking chess pieces and catching spiders. To those who he loved he was incredibly affectionate, and would even sit on people’s laps if he particularly liked them. He had a tendency to be a little grumpy, but ultimately was affectionate deep down – just like Susu. 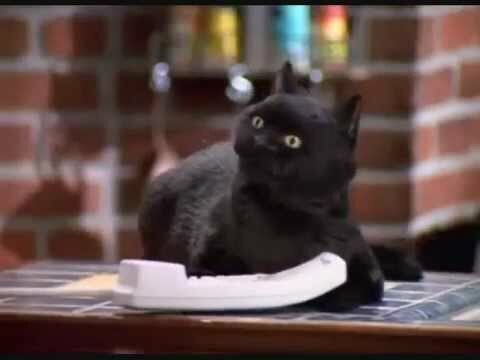 The sassiest little black cat around, Salem the Cat from 90’s hit Sabrina the Teenage Witch is an actual icon. Salem, voiced by Nick Backay, is a witch (with world-taking-over fantasies) turned into a cat who is left under the care of Hilda and Zelda, the protagonist of the show’s aunts. With his witty quips and one-liners he often steals the scene, but generally his sarcasm is reflective of the comedic tone of the show. Sabrina was a show that was aired before my time, and yet, through re-runs and through pop culture, the character of Salem is just as beloved to me as to many who watched the show upon its initial airing. His friendship with the titular character was often teasing, but at times you got a sense of a real genuine connection – the kind that anyone would wish for with their pet. He was a wingman, advice giver, and a best bud all rolled into one sassy, camp, black ball of hilarity. The best kind of cat you can ask for. 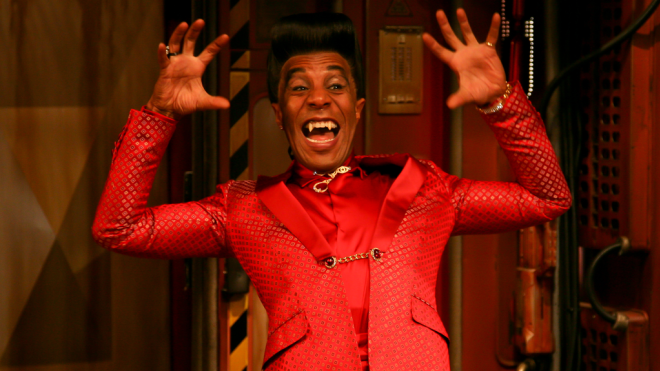 Cat might look human, but Danny John-Jules’s Red Dwarf character is 100% feline. After a radiation leak wiped out the crew of an interstellar mining ship, a race of humanoid cats evolved in the hold after three million years of floating through deep space. Cat is last known member of this new species, the other Felis Sapiens warring over their fish-based religion. It’s an odd concept, but it spawned one of the show’s most memorable characters. Cat is aloof and vain, so it’s not too hard to see his feline ancestry coming through. Later episodes of Red Dwarf even introduced his catlike reflexes and enhanced sense of smell. He’s a fine dresser, excellent dancer and a great spaceship pilot. Cat has really got everything. He even had a song reach number 17 in the real UK Singles Chart. Seriously. Marie, the pink-bowed, white-furred, blue-eyed kitten from Disney’s Aristocats doesn’t start fights, but she can finish them. With all her prissiness, sassiness, and ladylike airs, she can hold her own against her brothers, Berlioz and Toulouse, and practice her scales and her arpeggios (as well as biting and clawing) along with the best of them. Voiced by Liz English in the 1970 animated film, Marie is the middle and only female kitten of Duchess, the cat with eyes “like sapphires”. She was supposed to have a song in the film that was removed, and she was also meant to be the star of a sequel that was eventually cancelled. In the DisneyToon animation, she would fall in love with a cruise ship kitten, and get her and her family drawn into a plot to take on a jewel thief. 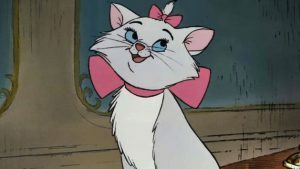 Although this lost potential is something little Marie would not put up with, the spoilt kitten of Aristocats supplies enough iconic lines and daydreamy sighs to make her my favourite cat in animated history. I’m an unapologetic cat person and choosing just one favourite fictional feline was a challenge considering all of the many amazing and memorable cats from film, fiction and beyond. 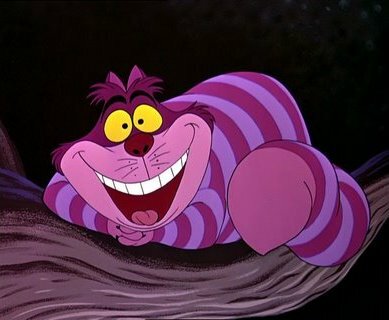 However, I can’t deny that the grinning Cheshire Cat from Lewis Carroll’s Alice’s Adventures in Wonderland and the later Alice in Wonderland films is probably my favourite cat (barring my own actual ones!). He was an icon of my childhood right from when I first saw his pink and purple stripes and ever-present grin in the Disney classic. Then, reading the book as an adult, his unconventional wisdom and the way he embraced what made him different set him apart from the more conventional moggies. He’s an antihero with a mischievous smile and disappearing act that made him the best bit of both the films and the books; with famous quotes like, “We’re all mad here,” what’s not to love? 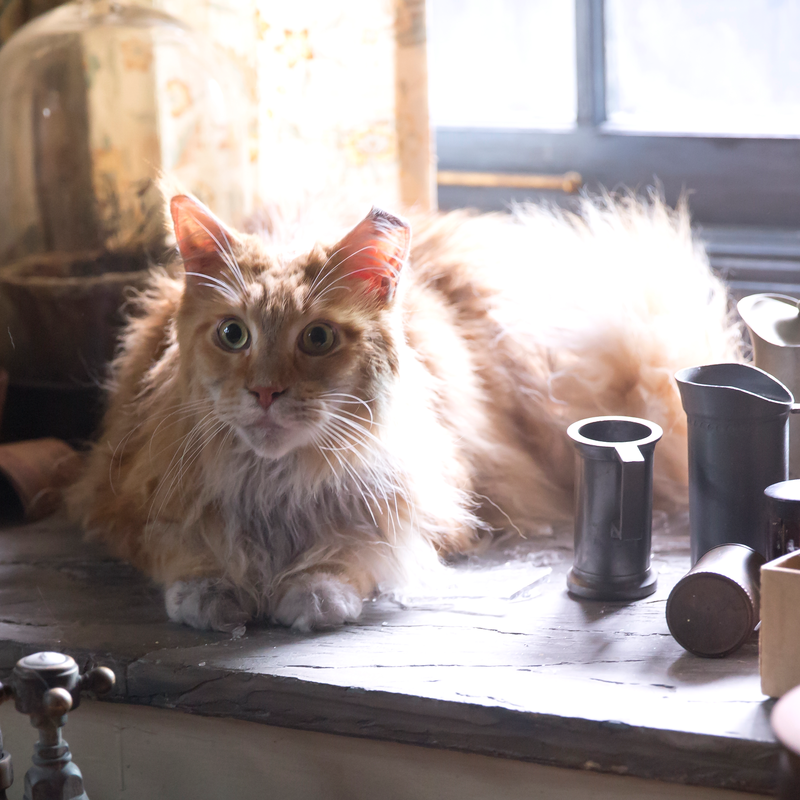 Described as an ugly cat with fur the colour of rotting squash and as having a mashed-in nose and half of one ear missing, Buttercup from The Hunger Games gets my vote as one of the best fictional cats. Why? Because he’s more than just a pet shoved into the narrative to flesh out the set or to make a character more likeable. On the contrary, when we first meet him in Suzanne Collins’ trilogy, he makes the protagonist Katniss Everdeen even more unlikable as we learn how she tried to drown him as a kitten. Throughout the trilogy, Buttercup was a character of his own giving some comic relief at District 13, providing comfort to both Everdeen sisters and surviving through the war all on his own. He may be an ugly moggie with a bad attitude but that’s what makes him so darn brilliant. 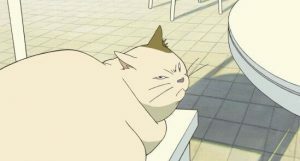 Muta, also known by his alias Renaldo Moon, is a master criminal and reluctant sidekick from the Studio Ghibli classics Whisper of the Heart and The Cat Returns. Apart from identifying with him due to our mutual love of food, he’s got great advice for protagonist Haru and has spawned hundreds of memes (google ‘Muta Wrecking Ball’, seriously) because of his antics throughout the films. He’s drawn beautifully in iconic Studio Ghibli style and reminds me a lot of my old cat, who was about as portly as Muta is, and three times as grumpy! Was it weird that I used to love a TV show about a con-artist alley cat that lived in a New York rubbish bin? Potentially. But between episodes of Scooby-Doo and Wacky Races, Top Cat was a sure favourite when I was a kid. I can still remember him banging bin lids together to summon his gang as he plotted his latest scheme with Benny. 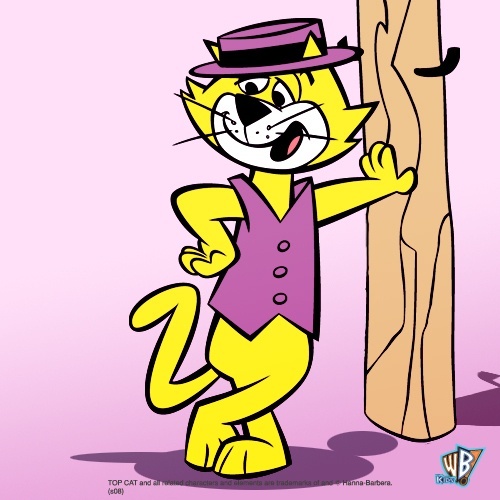 Top Cat had all the best schemes- he had a few tricks up his sleeves, or should I say fur? From tying string to a coin when using a vending machine to convincing some billionaires that his friend Benny was their long-lost cat, Top Cat tried them all. With his thick New York accent and debonair purple waist coat and matching top hat, Top Cat and his gang have been on children’s television since the 60s, and working their way into kid’s hearts ever since. Absolutely the most effectual cat! Mogget, the Abhorsen’s sarcastic servant in Garth Nix’s ‘The Abhorsen Chronicles’, is one of the most begrudging yet helpful characters I’ve ever come across. Ignoring the fact that he is a demonic entity in the form of a white cat who will probably kill you upon the removal of his enchanted collar, there is something endearing about the idea of having a talking, white cat to sleep in your bag and provide you with sarky life advice on your travels. In a way, I doubt Mogget is too different from many domesticated cats in our non-fantasy world, some of whom seem to prefer practising the hunting skills of their ancestors and the taste of human blood to human affection. Mogget’s dark and dangerous past as a vicious and powerful monster of magic makes him an intriguing character and, were he real, the most dangerous floof I would ever dare to pet. Of all the fictional cats, the mischevious and Latin-influenced Puss in Boots stands out for me, and not only because I fell in love with him in Shrek as a child. For me he represents everything we love about cats. On the one hand, they have their naughty and fun side causing trouble. 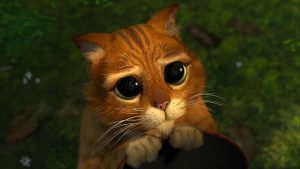 At the same time, though, they have their cute and adorable side: I mean who couldn’t fall in love with Puss’ eyes? Of course, Puss doesn’t originate from Shrek – in fact, historians have back-dated the fairytale of the mischevious cat who deploys trickery and deceit to obtain power back to the 16th century. Cats have always held a special place in the public consciousness and Puss exemplifies this. He has since appeared as a character in Tchaikovsky’s ballet and had a pantomime created around his story. Long story short: we love cats. We adore cats. Just cats! There’s nothing left to say, really. We do love cats, and we loved Susu. R.I.P. Third year English student, and long-time lover of film and literature, most especially the antics of Marvel and Disney.